Imagine, if you will, that it’s the last day of the 2029 WFTDA Championships. After another crazy weekend of roller derby featuring some of the best teams in the world, the two finalists find themselves facing each other for the Hydra. The final game winds up going back and forth the full 60 minutes. Neither team can pull out a comfortable lead. Going into the last jam, the score is tied. Both teams pour on the defense in a desperate push to steal the winning points. Miraculously, the jam goes the distance and no one scores. It will take overtime to settle it. Do they play one overtime jam to determine the victor? How about a five minute overtime period? You see, sometime in the late 2010s, the WFTDA adopted controversial new overtime rules. Tired of the same-old passing-for-points system used during regulation, the powers-that-be re-introduced a sudden-death format that was popular with TV rollersports audiences some 40 years earlier. Believe it or not, this was actually A Thing. It was broadcast on syndicated television. Millions of people watched it. Not only that, it was one of the most popular TV shows in its day. If you grew up in 1980s America, you no doubt remember Rollergames, the derby-like spectacle that featured a figure-8 skating track, a jump ramp that launched skaters into the air, and the super-high banked Wall of Death. Most famously of all, it had an alligator pit in the infield of the track used to break ties in sudden death overtime. Many skating in the modern game today may remember something about alligators and roller derby crossing paths at one point in the game’s history, but lack the specific details owing to the fact that the TV show is 25 years old. 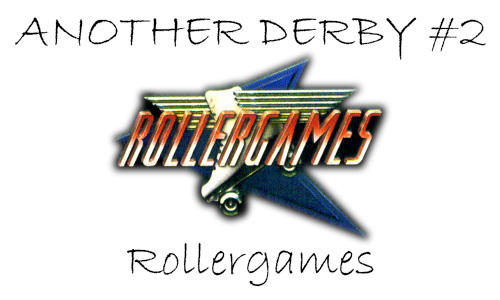 But Rollergames was a more than just a one-off mutant version of roller derby. There’s a rich history behind the promotion that planted its roots in Los Angeles and ended its run after four decades of giving roller derby the Hollywood treatment. As is the way in Hollywood, Rollergames was a heavily-scripted theatrical version of the game. But that doesn’t mean it was completely “fake,” as many in derby today are quick to mislabel it. Into the early 1950s, roller derby was continuing to find itself in financial difficulty. Overexposure in the east and midwest of America meant there were fewer and fewer places to turn a profit and stay alive. Seeking greener pastures, Leo Seltzer moved his promotion to Los Angeles. Upon his arrival in Southern California, Seltzer established a new team, the Los Angeles Braves. Never one to go half-hearted with anything roller derby, the Braves made their debut in the Rose Bowl in the summer of 1953, playing in front of thousands. Seltzer initially found the new California successful and stable enough to establish more teams in the state, most notably the San Francisco Bay Bombers in 1954. However, the tours were not particularly profitable, and the man who invented roller derby once again found himself fighting for the survival of his game. Through the rest of the decade, crowds continued to dwindle, and derby’s financial situation was approaching critical mass. Ticket sales in L.A. had seemingly dried up, forcing Seltzer to move the home base of the Braves to the northeast United States. A last-ditch effort to play a series in New York did not take hold, putting roller derby on the very brink of extinction. Seltzer was this close to pulling the plug on derby right then and there. However, his deep loyalty for the game made him press on one last time. Roller derby moved operations north to San Francisco and bet the farm that a new television station in the area would help promote its shows enough to get by for another year or two. It was around this time, in 1958, when Leo Seltzer retired from the day-to-day operations of roller derby and gave the keys to the kingdom to his son, Jerry. Jerry Seltzer had a new plan for roller derby: Do whatever necessary to get butts in seats and make roller derby financially viable again. Leo’s ambitious dreams to make people respect derby for its legitimacy didn’t get people to buy tickets on a consistent basis. To turn the promotion around, Jerry made the decision to showcase the game’s theatrics and celebrate its characters as much as the sport’s players and their athletic abilities. With the help of good television coverage and a willingness by the skaters—some reluctantly—to showboat a bit more than they had been doing in the past, roller derby turned itself around and effectively became the country’s first nationally recognized sports entertainment promotion. But the millions of derby’s reemerging fans didn’t know that; they just knew was that it was a sport, and what they were watching was very, very entertaining. As roller derby entered its golden age into the late 1960s and early 1970s, however, rival groups were keen to capitalize on the game’s success with their own derby events. In 1960, a small group of roller derby skaters split off from the Seltzer promotion and came back to Los Angeles to start a brand-new roller derby league from scratch in hopes of finding their own fame and fortune. They ran into a problem straight away. Although they were going to play roller derby, they couldn’t call themselves “roller derby.” Roller Derby was a trademark of the Seltzer family for their side business, the Roller Derby Skate Company.2 Planned to be a rival promotion, they needed a separate name to differentiate themselves from the roller derby that left the city a few years before, but still be recognizable as a roller skating sport at a glance. It was decided that this new style of play was not to be called roller derby, but “Roller Games.” And the centerpiece team of the Roller Games league was the Los Angeles Thunderbirds. The T-Birds, as they were better-known, held their first game in 1961 and became an instant success. Los Angeles crowds loved the hard-hitting action and acrobatics of players playing the game in a different style than what Seltzer’s roller derby brought audiences. This attracted promoter Bill Griffiths, Sr., who soon bought the league and quickly expanded it. In just a few short years, new teams operating under the Roller Games banner were established in New York, Philadelphia, Chicago, Detroit, and Texas, among other places. With the rapid proliferation of television stations and more affordable tape recording technology, Roller Games (and indeed, Seltzer’s Roller Derby) reached more and more people, making it more and more popular. The T-Birds rode this success to become a sports icon in Los Angeles, becoming so wildly successful that their games were broadcast on TV during highly-coveted—and financially lucrative—prime-time periods. With the help of that exposure, T-Birds championship games were held at the 16,000-seat L.A. Memorial Sports Arena, drawing nearly that many in some years. The international Roller Games all-star teams. The success of Roller Games as a rival group to Roller Derby was making waves to the point where skaters were switching allegiances between leagues. The big-name stars in each group were never interested in crossing lines, but many mid-pack skaters in Roller Derby would sometimes find better success in Roller Games, and vice versa. Some would even play both sides, glad to put in honest work for whichever company was paying them for their time. Despite this, there was never a unified roller derby interleague championship between the Seltzer and Griffiths promotions. Even with their mutual success in television and sold-out crowds filling arenas, each were happy to keep to themselves. Part of the reason for this may have had to do with a growing difference of opinion on how to showcase the game to the masses. Seltzer wanted to keep a balance of show vs. sport. Griffiths was more than happy to give the crowd more theater in a sports environment. Around the time man walked on the moon, this was starting to cause a noticeable divide between promotions. Particularly among the skaters, who began picking sides and staying with them. Rarely, there would be special exhibition games between two most famous roller derby teams in the country, the Los Angeles T-Birds and the San Francisco Bay Bombers. They were wildly anticipated and stupendously successful events, but didn’t happen as often as maybe they should have owing to the schism between outfits. However, there was one very special event where the two leagues amicably agreed to make roller derby history. 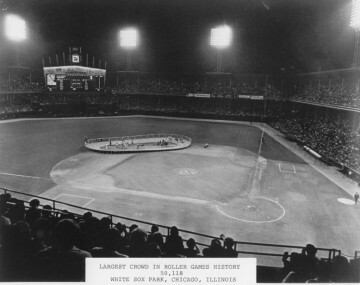 To this day, the largest-ever crowd to see a roller derby game—50,118—filled Comiskey Park in Chicago on September 15, 1972 to witness what was indeed an interleague game between Roller Derby’s Midwest Pioneers and the L.A. Thunderbirds of Roller Games. The demand for this game was (allegedly) so great, another 15,000 fans were turned away at the gates. More than 65,000 people could have watched derby history unfold if there was a venue large enough to accommodate them. Sadly, this event was Jerry Seltzer’s swan song. His derby promotion would cease operations just a year later. When Roller Derby folded at the beginning of 1974, Griffiths saw an opportunity and took over many Roller Derby assets. A new international league, the International Skating Conference, was formed around this new opportunity, and the L.A. T-Birds continued to be the league’s centerpiece. Griffiths also opened his doors to former derby skaters who suddenly found themselves with no job and nowhere else to turn to, offering them work in Roller Games. 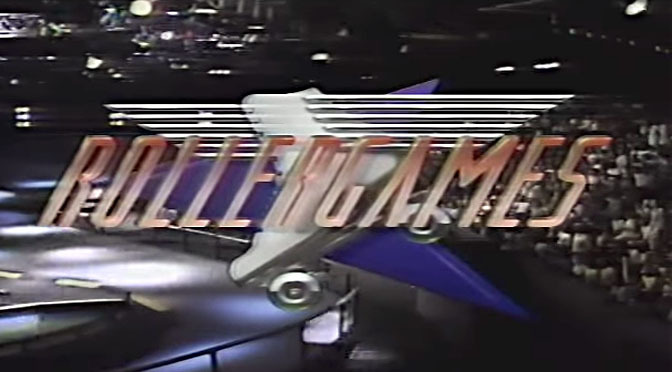 With everything working in its favor, it appeared as if Roller Games was ready to become a world-wide phenomenon, and nothing could stop it. But the script had other plans for them. As Roller Games exploded from the Los Angeles minor leagues to a major international force, it began to experience the same “phony” derby effects that Leo Seltzer’s classic game had to deal with during its own early, rapid growth. This time around, instead of the newspapers highlighting the rough play and tough skaters, television was doing the communicating. The saying goes, pictures speak louder than words. While Jerry Seltzer attempted to strike a balance between appearance of a legitimate sport and the theatrics of an entertaining show, Griffiths was interested in no such balance. He saw how well his live events were doing financially, and instead of changing the formula for success, he continued on with it, giving the people more of what they wanted. And we all know what they wanted. The theatrics of Roller Games is what ultimately came to define and differentiate itself from the relatively straight-laced Seltzer Roller Derby. A lot of the “fake” derby that modern skaters and fans remember and refer to when referencing theatrical past of the game was actually more from the Roller Games side of the split. While Roller Derby had its WWE moments, Roller Games was full-out ECW, with players scoring points being far less important than in the over-the-top, ridiculous way they scored them. This caused problems. When Roller Games took in former Roller Derby skaters, many of them didn’t like skating in an artificial, more heavily scripted environment. The drive for a legitimate competition that Leo Seltzer pounded into his players was, in a way, passed down into the show-sport balanced Jerry Seltzer brand of roller derby. But there was very little legitimacy in the way of, for example, being told to “accidentally” take out your teammate on the play so the other team’s jammer could leap over them for a spectacular score, a common sight in a Roller Games show. This tension between some of the players and the overall heavier emphasis on theatrics in Roller Games eventually came around to bite them. Despite an international presence, wide-spread television coverage, and years of derby exclusivity, Griffiths was forced to abruptly shut down the large-scale operations of the league in 1975 and downsize to more humble levels due to waning fan interest. What Leo Seltzer feared 30 years earlier ultimately came to pass, though with his future competitor: People were starting to get tired of seeing the same old thing. You can only play a traveling circus so many times without refreshing the act, and with some performers tired of literally jumping through hoops over and over again, Griffith’s one-ring show just wasn’t staying popular enough to financially sustain the growth it had achieved. In the mid 1970s, the T-Birds were only playing games once a week, if they were lucky.5 There wasn’t much money to even sustain that—the paychecks weren’t exactly rolling in with no international tours or television coverage to pay the bills. Some players had enough and retired from the game. The ones that persisted did so to the point of going as far as taking a second day job to stay afloat financially. After a few years, the players that stuck through the hard times eventually saw the light at the end of the tunnel. Into the 1980s business was starting to pick up again, though at nowhere near the level seen during the previous decade. With Griffiths able to take advantage of a new generation of fans, he established a stronger eastern base of operations Philadelphia, then a southern base in Texas. 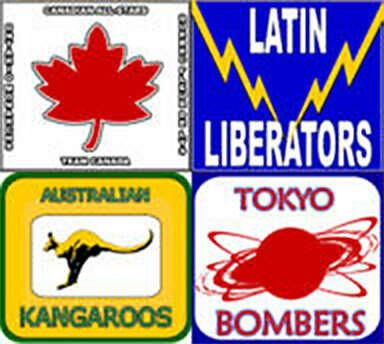 All-star teams were reassembled in Mexico and Australia, prompting the newly re-named Roller Games International to take the-T-Birds around the world once more. However, the deal turned out to be short lived, as a renewal deal fell through over money. With a major revenue stream gone and RGI again having slashed-and-burned their way through their tours, not having the resources or talent available to spread itself across the globe, he was forced to again suspend major operations. Unlike the comeback in the early 1980s, this time things looked much more bleak. Their L.A.-based training facility was closed in the mid-1980s, making it impossible to train new skating talent to replace aging stars. As more legacy players retired from the promotion, skating quality diminished. Forced to work with what he had, Griffiths returned to the old one-ring circus act, only to fall into the trap he fell into a decade earlier: The same-old, same-old with nothing new to see. The T-Birds still put on shows to local audiences around the Los Angeles area throughout the remainder of the 1980s, but drew numbers that were a fraction of what they attracted during their golden years. With no major capital to work with and a dwindling pool of talent, Griffiths and his Roller Games promotion seemed doomed to a slow, quiet death. But then, a plot twist: Hollywood came calling. This was not to be the first time foreign audiences were introduced to roller derby itself, however. Versions of the game made their way across the Atlantic not long after it was invented in the late 1930s, where it ultimately came to be known as “Roller Catch” or “Roller Speedway.” The scale and popularity of derby in Europe was never as large as it was in America, but it was definitely there. A business that still exists to this day. Japan’s place in roller derby history is unique…and very Japanese. You’ll find out why in parts 3 and 6 of this series. Though at the time still a minor promotion compared to the might of Roller Derby, the international success of Roller Games had enough of an influence on Jerry Seltzer that he created the International Roller Derby League (IRDL) with his most popular teams, including the Bay Bombers, Northeast (née Los Angeles) Braves and the Midwest Pioneers. Never mind that Seltzer did not have any international teams in his “international” league. But nonetheless, there was definitely pressure of competition. In their heyday, Roller Games events were playing at least four times a week. Virtually all of the derby on TV through the late 1970s and 1980s was Griffiths-owned Roller Games properties, including the ESPN broadcasts. Syndicated shows like Rollermania and Roller Super Stars—again, names that avoid using the phrase “Roller Derby”—were most prevalent. An episode of Roller Super Stars was a target of the short-lived ESPN Classic show Cheap Seats, kind of like a Mystery Science Theater 3000 for sports events.